Are you with the bride or the groom? This wedding photo shoot’s about to get real. So, just for curiosity’s sake, why is this assumed to be a *wedding* photo they’re getting? I don’t really know. Is it important? It’s probably not a wedding shoot, since those don’t usually have those kind of backdrops, and this looks like it takes place in a grubby studio. But I felt like making the “are you with the bride or the groom” joke, and that’s all that matters. She looks like a real bridezilla, alright. They’re finally getting married because the kids are asking too many questions. 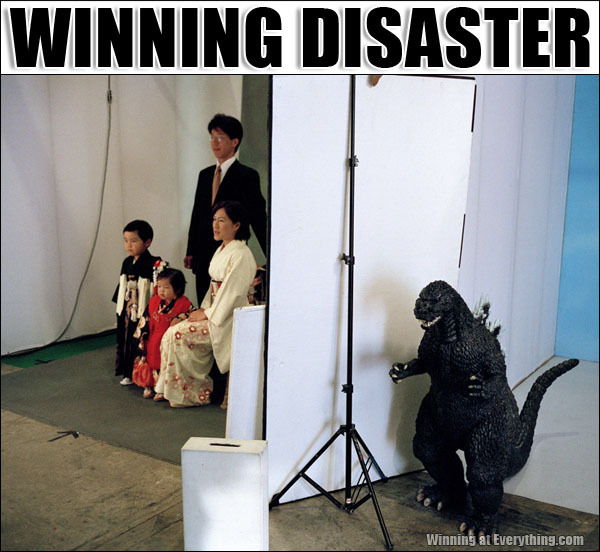 Gozilla hid in fear from his only natural enemy – the 100 meter Asian family.